Why is Communication Important in Healthcare? 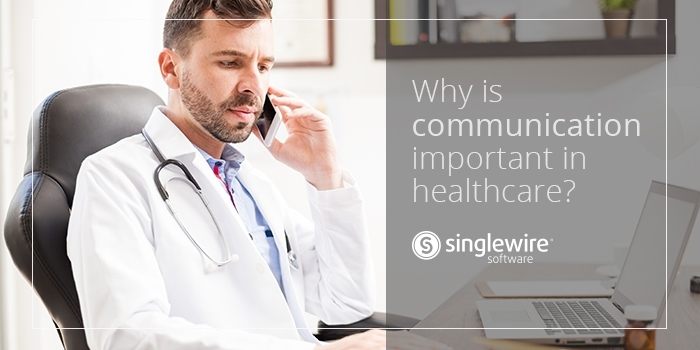 Healthcare environments rely on effective communication for successful operation. Patient satisfaction is always a top priority in healthcare, and without effective communication, this can be a difficult goal to achieve. Effective communication can save time, minimize confusion, and potentially save lives. That’s why it is important for hospitals to encourage effective communication between healthcare professionals. Whether it is a patient need, severe weather disruption or threat to the building, the importance of communication in healthcare cannot be overstressed. In this blog post, we’ll discuss the benefits of strong communication skills in healthcare settings, and how emergency notification systems can help facilitate this. So what is effective communication in healthcare? Effective communication is being able to reach the right people with the right information at the right time. Take, for example, Laguna Honda Hospital in San Francisco uses an emergency notification system that is tied to its patient tracking system. When a patient wanders outside of a designated area, a message is automatically broadcast to alert staff. Since patient safety is a top priority for any healthcare facility, being able to keep track of patient locations and direct them back to their rooms minimizes risks and saves time. Being able to share patient location helps keep them safe, which is one of the reasons why communication is important in a care setting. Communication in the healthcare field can be challenging, but with the right tools and training processes and procedures can be put into place for an efficient operation. Riverside Health in Illinois offers a good example of effective communication in the healthcare. Their facilities utilize InformaCast as a communication tool to keep large numbers of people and targeted groups, like senior leadership, informed of potential crisis situations. As soon as a switchboard operator hits a button to activate a message, it is sent to the mobile devices of the people that need to be informed. With more than 400 people using the InformaCast Mobile app, information is able to spread quickly. Messages can cover everything from severe codes and basic notifications to downtime notices. As mentioned in the examples above, InformaCast emergency notification can help healthcare facilities achieve effective communication strategies. With the ability to connect to multiple devices and send messages in a variety of formats, InformaCast offers a flexible solution for healthcare environments to convey important information. Since healthcare facilities are sensitive environments, it is often disadvantageous for messages to be shared throughout a building. With InformaCast, healthcare facilities can designate zones, so only certain messages are heard in certain areas. And with the InformaCast Mobile app, that functionality can be customized even further. A healthcare facility has a large number of moving pieces, and the only way everything runs smoothly is if everyone knows what they are supposed to be doing. An emergency notification system like InformaCast offers a large opportunity to improve communication and develop practices that help can benefit healthcare workers, patients, and visitors.